I’d seen plenty of macaron recipes online, but like many in the Cupcake Project Facebook community, I found macaron recipes intimidating. I’d heard macaron recipe horror stories like, “It was raining outside so the macaron recipe didn’t work at all,” or “I over or under-mixed so the macaron recipe failed.” I had decided that macaron recipes weren’t for me and that I should stick to cupcake recipes. 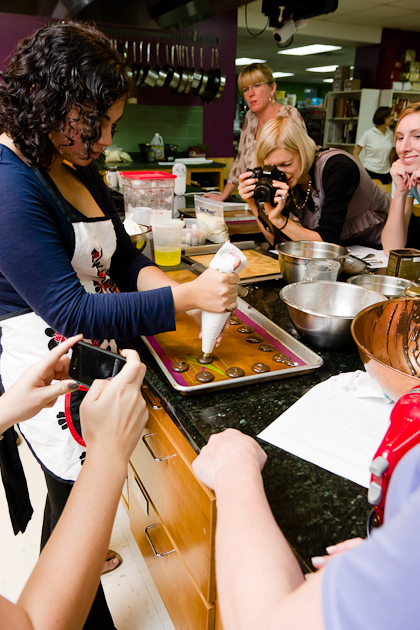 Amrita teaching St. Louis food bloggers how to make macarons. Last week, however, things changed. I was invited to learn the art of macaron making from fellow St. Louis food blogger and self-taught macaron expert Amrita of The Sweet Art. 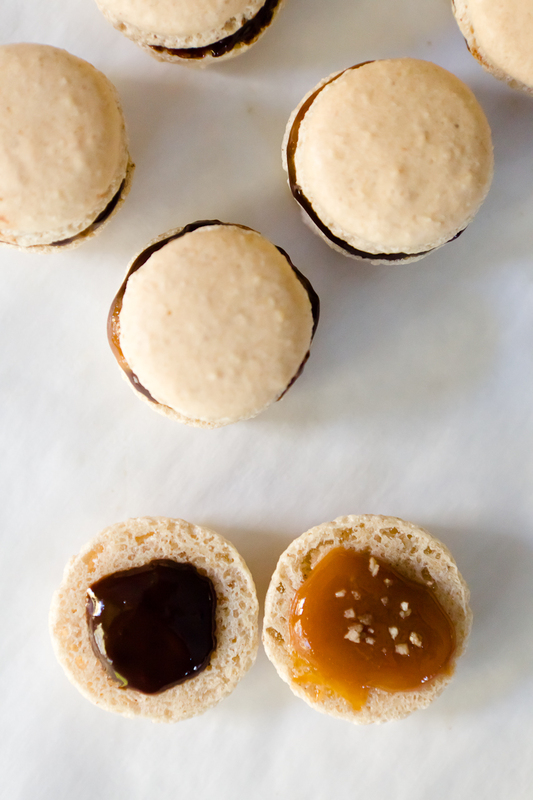 Amrita made macaron recipes seem so easy – because they are. Sure, there are a lot of steps and you’ve got to read the tips and tricks carefully, but if you can follow a cupcake recipe and make cupcakes, you can make macarons. In fact, I’m going to go one step further and say that it is actually easier to make adorable macarons than cupcakes because you don’t need to be an expert at making pretty swirls of frosting to make your macarons look like they were made by a professional pastry chef. Are you Talking About the Coconut Cookies That Look Like Little Haystacks? This is a macaroon, not a macaron. If you aren’t an avid reader of food magazines and baking blogs or don’t live in a city where French macarons have become mainstream, you might make the mistake I did at first and confuse macarons with macaroons. 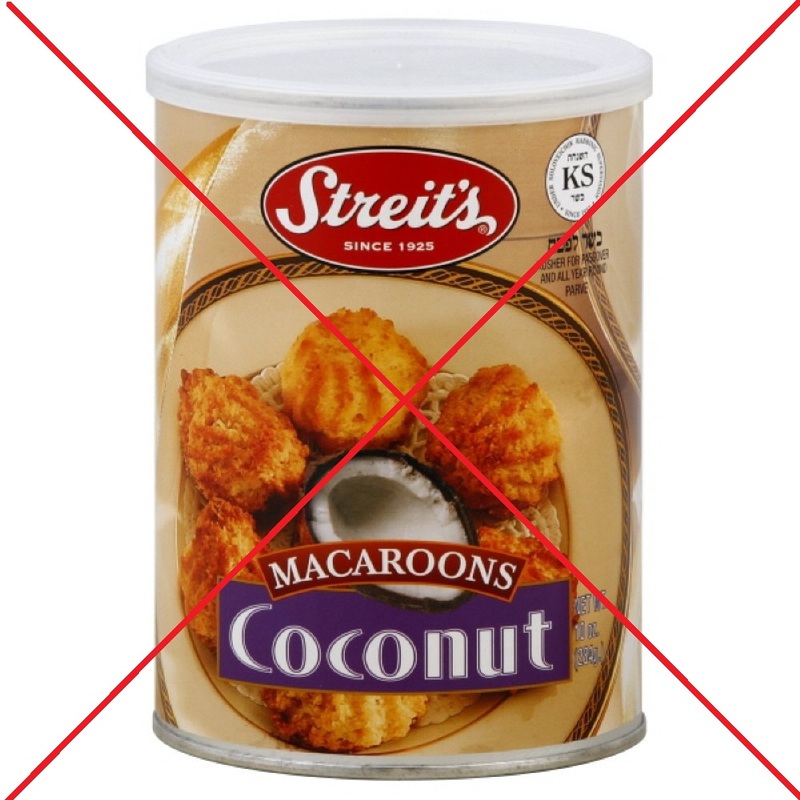 Macar-oo-ns are coconut cookies that are commonly served during Passover in the United States. 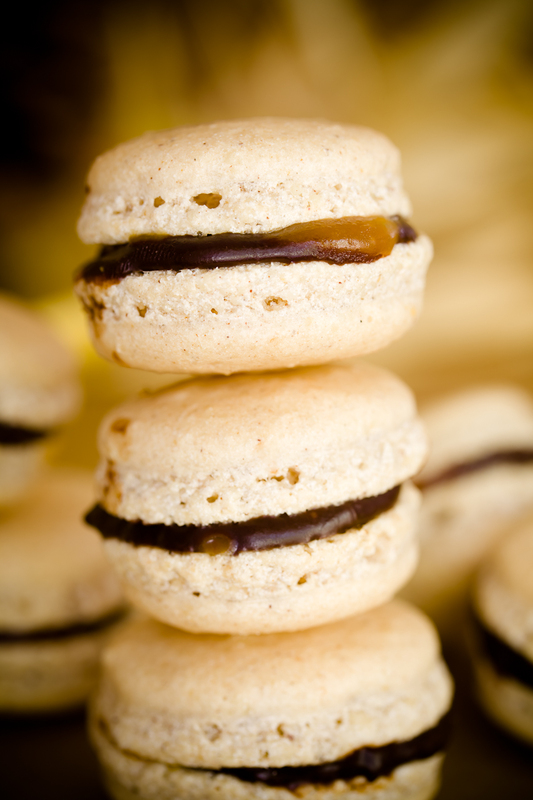 Macar-o-ns are Parisian meringue and almond flour cookies that have a thin outer crust and are chewy on the inside. Today, most macaron recipes call for sandwiching two cookies together with any number of fillings (although it’s not the traditional way of preparing them). I had to write out the title of my first macarons one more time – even just hearing the name of it makes me want to run down to my kitchen and eat another one. Eating a bite of this macaron, you can taste each flavor: the Fall flavors of cinnamon, nutmeg, clove, and allspice, the decadent chocolate ganache, the sweet, creamy caramel, and the smoky finish of the smoked sea salt. Plus, there’s the textural perfection of a macaron. Few desserts give you a crunchy and a cloud-like texture all in the same bite. These macarons are not a dessert to leave out and let your teen and his friends gobble up (Charity Schmidt just shared a story on Facebook of how that happened when she made my homemade goldfish recipe). Rather, these should be given out one or two at a time as a special gift to be savored. I got the macaron recipe from Amrita at The Sweet Art. 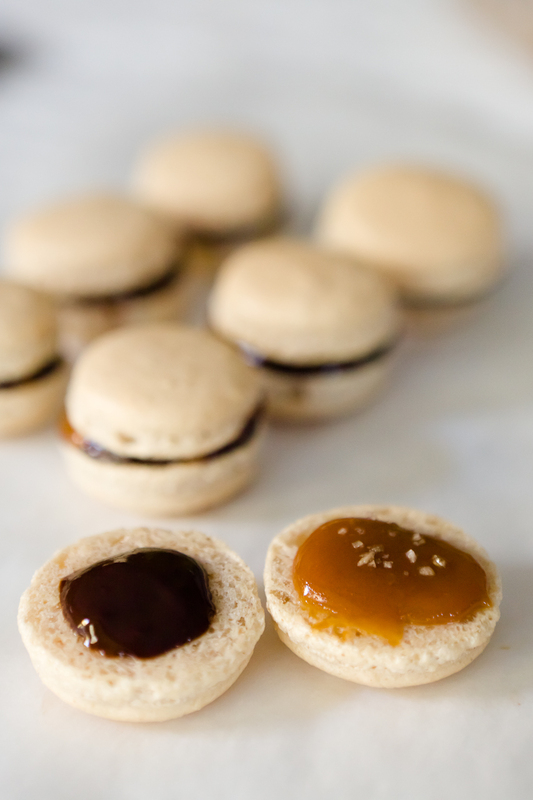 She adapted it slightly from David Lebovitz’s macaron recipe. The only changes that I made were to add pumpkin pie spice and my combination of fillings. The recipe below is theirs, but with my notes and tips. 1. I get lazy with cupcake recipes (sometimes I don’t even level my cups of sugar and flour – for shame), but macarons are a different animal. Macaron measurements must be perfect! Don’t worry – it really is easy as long as you have a scale. I recommend a digital scale like the one from EatSmart. 2. 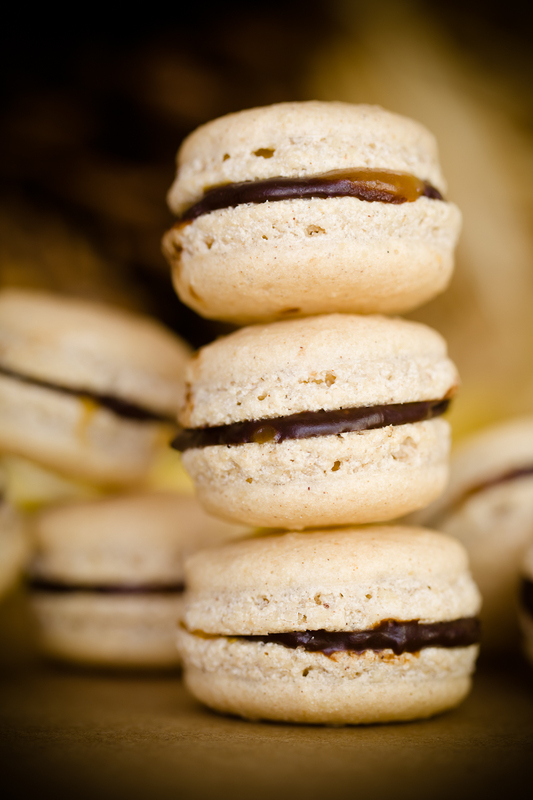 Bake this recipe the day before you plan to eat the macarons. Macarons need to “mature” overnight in the refrigerator. Whip egg whites in a stainless steel or copper bowl until frothy and white. If you don’t have a stainless steel or copper bowl, it will still work – just not quite as well. Joy of Baking explains, “Don’t use a aluminum bowl as it gives the beaten egg whites a grayish tinge as some of the aluminum does come off during beating. Plastic and glass are not good surfaces either as the whites tend to slip down the sides of the bowl and plastic attracts grease because of its porous surface.” Amrita warned us to always use a hand mixer so that we could closely monitor the egg whites. I don’t own a hand mixer and wouldn’t want to stand there with a hand mixer, anyway. There is a ton of mixing to do in this recipe. I used the whisk attachment on my Breville stand mixer and it worked perfectly. Add in the sugar and whip on high speed until stiff and glossy. Set a timer for seven minutes. At seven minutes, check and see how the mixture looks. 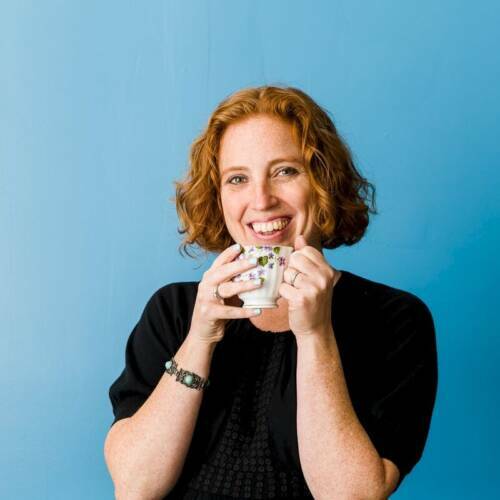 You should be able to hold the bowl upside-down and have nothing fall out (as shown below). It was scary, but I tried it! If it’s not done yet, whip for a another minute or so and check again. 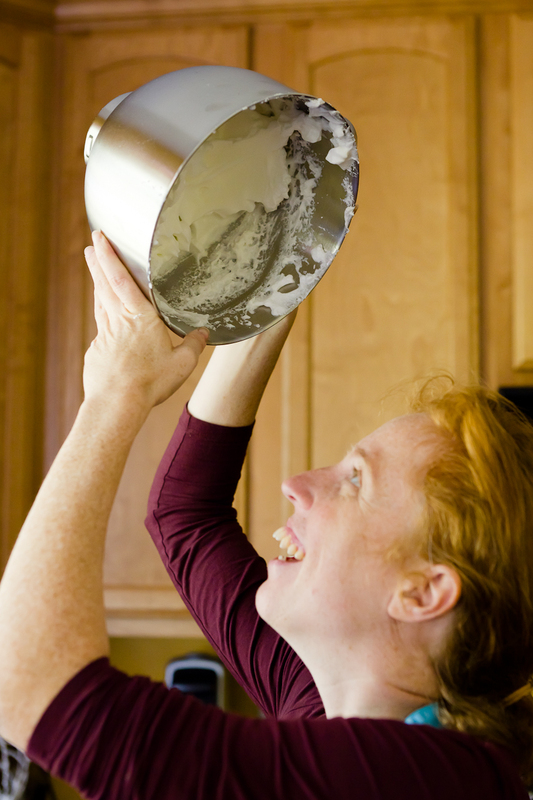 You know that your egg whites are ready when you can hold the bowl over your head. Warning: If you aren’t sure if it will work, don’t hold it over your head. That would be a sticky, messy cleanup. Try it over the counter first. Combine the powdered sugar, almond meal, and pumpkin pie spice in a bowl. Don’t worry about mixing them well – that happens next. 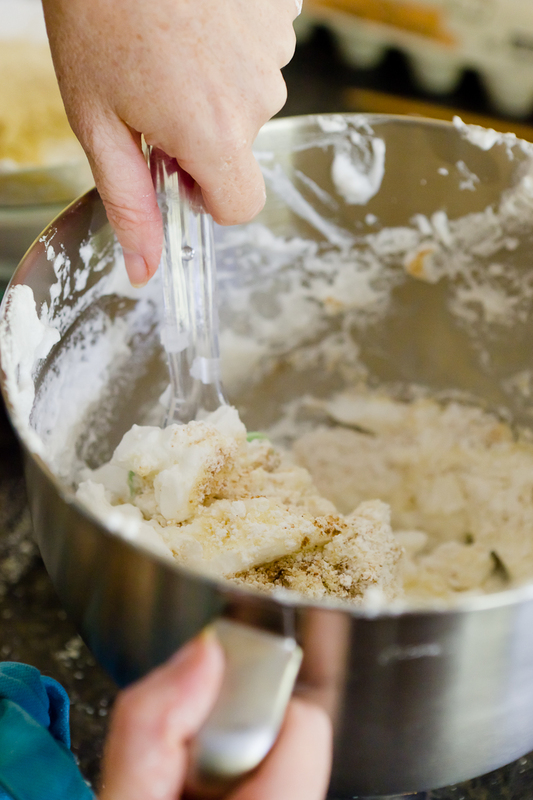 Pour about a quarter of the dry ingredients into the meringue bowl and slowly fold it in with a spatula. Scrape around the bowl and into the middle until the dry ingredients are incorporated. Continue to fold in small amounts of the dry ingredients until they are all combined. During this process, the meringue will deflate quite a bit. This is OK. Don’t get scared. 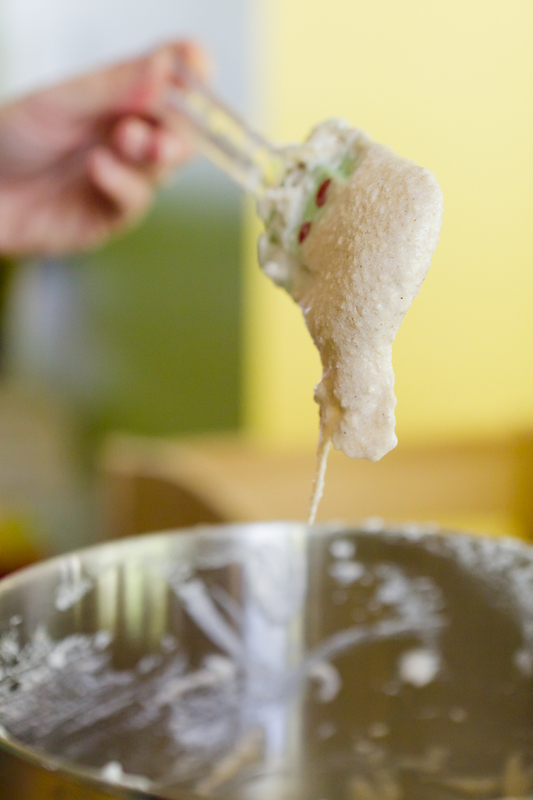 At the end, if you lift your spatula and let the batter drop, it should fall into the bowl in a thick blob, like porridge. Prepare baking sheets with a Silpat or pre-cut parchment paper. Amrita warned that parchment paper that curls up from being on a roll can cause the macarons to not come out properly. If that’s all you have, though, I wouldn’t worry about it – just stick the ends of the parchment paper down to the baking sheet with a dab of ganache to try to flatten the paper a bit. Use a piping bag with a round tip (or a sandwich bag with the end cut off) and pipe dollops slightly larger than a quarter onto your prepared mat or sheet. Leave a little bit of room between the dollops for the batter to spread. Don’t obsess about them all being the same size. As long as every dollop that you pipe has another that’s pretty close in size to pair it with, you’re fine. So, if you make one that’s a bit too big, just make another one a bit too big – no worries! The piped macarons. See the peaks? You won’t when the macarons are done. 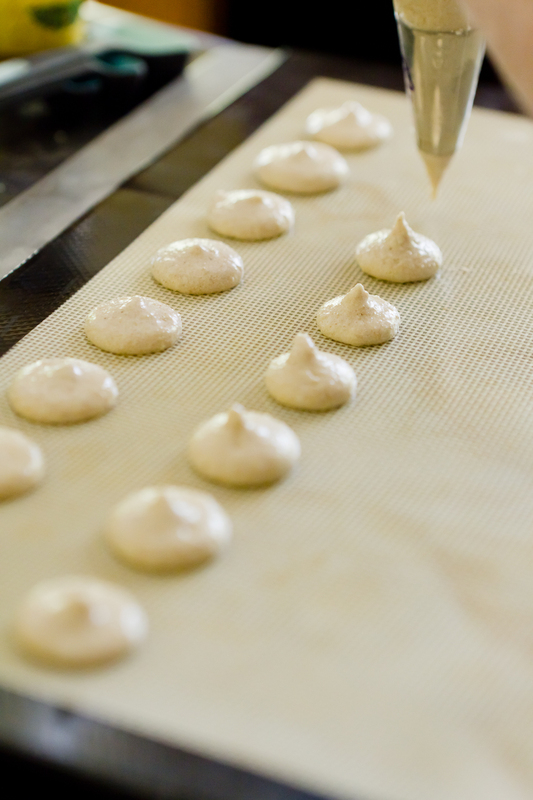 Let the piped macarons sit for about twenty minutes. During that time, you’ll notice that they level out some (so if you had a peak on one when you piped, it will be smaller or completely gone after the twenty minutes go by). Also, the macarons will develop a thin crust. You’ll know they are ready to be baked because you’ll be able to give them a little tap and your finger won’t sink through them. While the macarons are resting, pre-heat the oven to 285 F.
Bake on the middle rack for 18 minutes, rotating the tray halfway through. If your oven temperature is slightly off, you may need to adjust that time to accommodate. 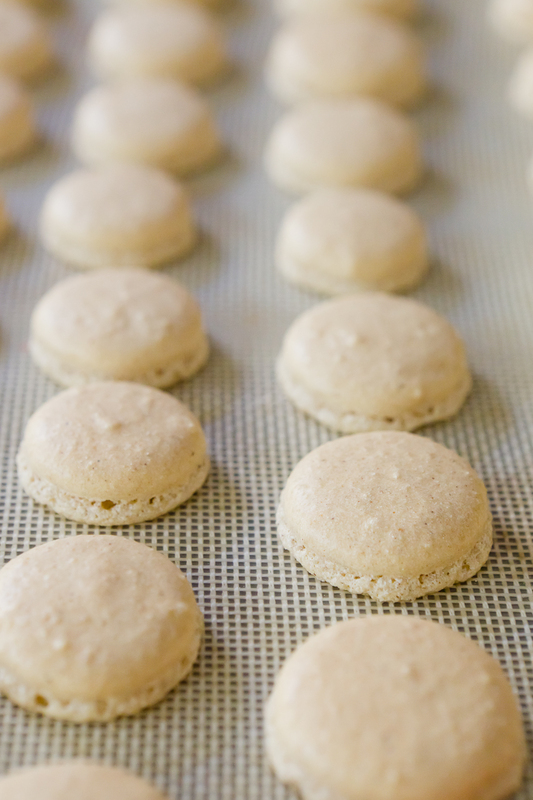 Wait for the macarons to completely cool before removing them from the parchment or Silpat. Amrita suggested that rather than lifting the macaron off the Silpat, I should lift the Silpat off the tray slightly and peel it off of the macaron. This technique worked really well. bottom after you bake them is called a foot. Perform macaron matchmaking – pair off each macaron with a similarly sized partner. Spread caramel on one partner and top with a sprinkle of smoked sea salt. Spread ganache on the other partner. This is the hardest step. The characteristic moist inside of the macaron won’t be there if you eat it right now. It gets moist by having some time to absorb some moisture from the filling. Put your beauties in the refrigerator and eat them tomorrow (after you take them out and let them come to room temperature). Trust me, you’ll be glad you waited. Amrita for teaching me her craft. Alana from A Veggie Venture for organizing the event. Kitchen Conservatory for hosting macaron making. Vivian from VivianMacaron for stopping by the Facebook page and directing me to the fabulous macaron tutorial on her blog. It’s definitely worth checking out. You know there’s a macaron cupcake coming soon! My first attempt at macarons had less than stellar results. I always thought I’d try them again “some day” and this has given me some great insight for a second attempt. Seeing the photos of your progress is so helpful! Yay for breaking into the ranks of macaron makers! Yours looks lovely and the post is fabulous. So glad you could make it! PS Which reminds me. I have a pound of almond meal in the glove compartment. Ooops. Glad that my tutorial helped! I shall be back for your next post! Such a fun post! They look yummy. I have seen so many posts across the blogosphere about macarons. I’m gonna have to get off my but and give them a try. Yours look delicious! Great instructions! Thanks for helping the not-really-so-skilled kitchen enthusiasts like me. These are pretty little desserts…Yummy! I should take your advice. By the way, are macaroons supposed to be put on those cupcake racks? Since i saw variations that use such. Tabby – I don’t quite understand your question. What do you mean by cupcake racks? Wow! I just can’t wait to try this recipe out! It looks absolutely fabulous! Thank you for sharing it with us! Good job! I don’t have a silpat so I use parchment paper. I have found that I get better results when I double up the cookie sheets. I use the heavy-duty sheets but doubling them seems to even the cooking between the top and the bottom. i just made these for a Thanksgiving party. For some reason, they have a bit of raisin flavor. Interesting. Everyone loved them, though! Super delish, came out great! Thanks for the tips! I can’t thank you enough for this wonderful recipe and tutorial!!! I made these for the gift at my annual cookie exchange and they were a big hit. Thank goodness for my new Kitchenaid Stand mixer! Wanted to know what are the measurements in USA cups and ounces? I can’t afford a scale and all the websites that are converters say different answers. Please help!! !